GOTHENBURG, Sweden -- Beaver Truck Centre of Winnipeg has won the North American championship of the Volvo Vista competition, earning the right to participate in the world finals in Sweden in June. Dennis Baehnk (seated on motorcycle), Dan Teleglow (centre) and Chris Dunn will be representing Beaver Truck Centre at the Volvo Vista world championship in Sweden in June. 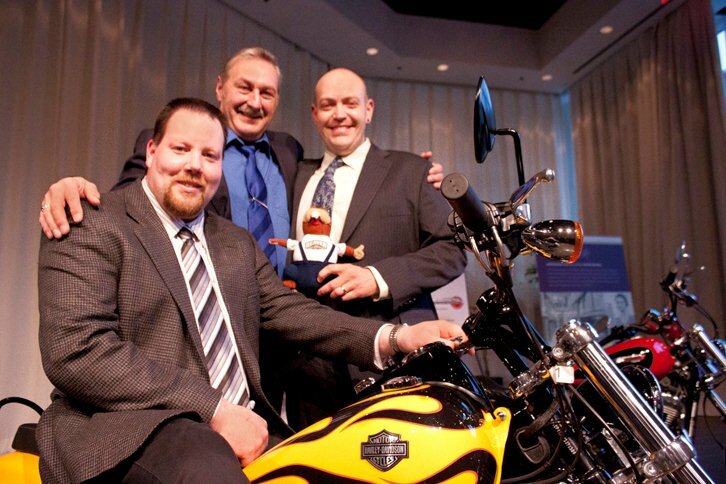 Each team member was presented with a motorcycle for reaching the competition's finals. GOTHENBURG, Sweden — Beaver Truck Centre of Winnipeg has won the North American championship of the Volvo Vista competition, earning the right to participate in the world finals in Sweden in June. The 2011 installment of the worldwide competition and training program for mechanics and service personnel started in September with a record 13,704 participants from 75 countries. The field was pared down to 153 teams from 3,740 original team entrants through three rounds of theoretical questions. Those 153 teams then participated in one of the 16 semi finals, which were held in nine locations worldwide, between late-March and mid-April, where practical skills were tested in workshops. Now Beaver’s team is among the 30 finalists to compete in the world finals in Gothenburg. “High competence in the service organization is an important component in Volvo Trucks’ total offer. The Volvo Vista competition contributes, in an excellent way, to achieving high quality standards and constantly develop our customer care,” says Staffan Jufors, president and CEO for Volvo Trucks. “We at Beaver Truck Centre are very proud to congratulate the team and wish them the best in Sweden,” said Barry Searcy of Beaver Truck Centre. Good job guys, good luck in Sweden !! !